I was invited to a really nice event at the Aveda Salon in Frisco. While there, I was treated to a hair style by a stylist from the Indira Salon, back massage, hand massage, and makeover. The Aveda Salon is located in the the Stonebriar Centre Mall near Barnes and Noble. Aveda offers a full range of services for walk-in customers or by appointment. Their products are by no means frugal, but I like the fact that the they are plant based and that Aveda strives to be environmentally conscious. Aveda offers full service pampering and a wide range of products not just for beauty, but also for well-being. I started out by getting my hair styled. The Indira stylist used Smooth Infusion products to give my hair a smooth, sleek, and voluminous look and feel. Aaahhhhh! This felt so relaxing even with all of the activity and noise going on in the salon. The Chakra Balancing Body Mist created a soothing atmosphere and the blue oil she applied to my neck stayed with me throughout the rest of the day. The make-up artist took his time and explained everything he was doing. The makeup products were light and natural looking. He left me feeling and looking young and beautiful! When you get the chance to treat yourself to a special day, Aveda Salons would be the perfect choice! 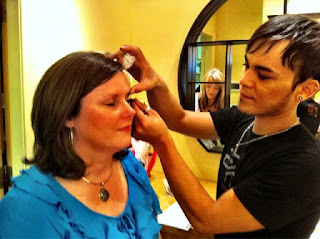 For more pictures of the Dallas Bloggers Party at Aveda check out She Is Dallas! *I participated in a free group makeover but did not receive compensation for this post. All opinions are my own. So glad to meet you! It was such a fun day. Thanks so much! hi, new follower from super stalker sunday hop. would love for you to visit my blog and follow back if you like. Did you know...Students eat FREE at IKEA? Don't Miss this Stunning Exhibit! Another Great Deal at CVS! *HOT* Pepsi deal at CVS - Wednesday 6/15 only! Genghis Khan Ticket Giveaway Begins Today! Aspiring artists - this sounds like fun! Just got a new "Grab My Button"!